Good morning! I've let the week slip away without checking in again, so very sorry. Have you been busy? I've been actually doing some sewing in between my other little jobs, things that need doing for market, things that need doing around the house. 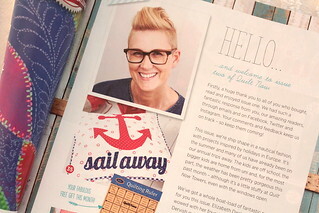 So I don't know if you've seen it, but I have a project in the second issue of Quilt Now! When Katy asked if I'd like to submit something I was so excited. 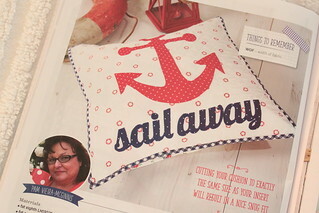 And even more excited when my Sail Away Cushion was accepted! I love the layout of the magazine. It's so fresh and the photography is wonderful. The project takes center stage but there's still lots of interest in the photo.. and it conveys the theme. 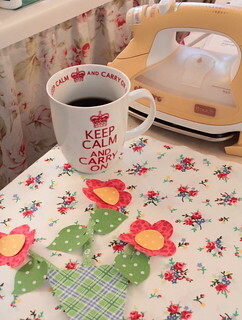 Don't you love the little washi tape notes? Well needless to say I'm pretty darn excited about it. So far you can't just head over to Barnes and Noble to get a copy, but you can order single issues from Pink Castle Fabrics and Fat Quarter Shop. I saw your project! So cute Pam. And I love what Katy's doing with the magazine, fresh, exciting and so charming! Dang! I was just at Barnes and Noble. I'll have to go back and get the issue. Love the pllow! Your pillow is super cute. I do like the looks of this new publication. Do you have wholesale contact information? It looks like something we might like to offer our customers. You are so talented and deserve the publishing! So happy for you!